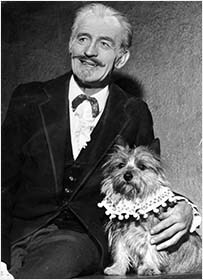 The Punch and Judy show on Llandudno prom is the longest-running in Britain, and John Codman played a vital role in the continuity. His grandfather Richard Codman started the show in 1860, having made puppets from driftwood collected from the Llandudno shore. The baton later passed to Richard’s youngest son Herbert, who died in 1961. 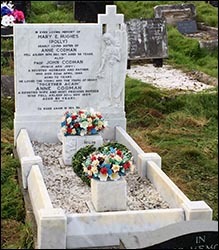 John, son of Herbert and Dorothy Codman, continued the family tradition. During Herbert’s old age, father and son would often perform half each of the hour-long show. Since John died, aged 72, in 1980, the show has gone on – thanks to two subsequent generations of “professors” from the same family. You can read more about the show on this page. John was born in Ashby de la Zouch, Leicestershire, and raised in Llandudno. The family of showmen still toured Britain outside the main summer holiday season, when Llandudno was quiet. John served with the Royal Welsh Fusiliers in the Second World War, and was among the last members of the British Expeditionary Force to be evacuated from Dunkirk, France, in 1940. His brothers Richard and Cyril both lost their lives in the war, serving in the Royal Navy. 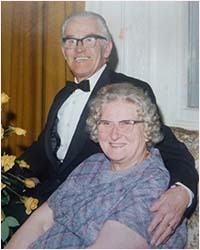 The photo on the left shows John with his wife Anne in 1979. John spoke little of his wartime service to his relatives, who were surprised by the large military attendance at John’s funeral in Holy Trinity Church.